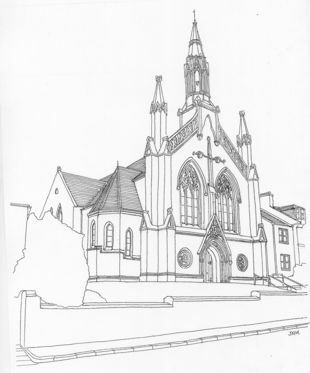 Built 1865-66 to a design by architect James Barbour of Dumfries for Maxwelltown Free Church. Centenary Hall added in 1966 to a design by Bill Dickie of architects Sutherland, Dickie and Copland of Dumfries. The church is roughly rectangular in plan with semi-octagonal stair pods flanking the north frontage. The south gable has apse with high level stained glass windows screened by the organ pipe array (installed 1948 – but now decorative). Gate piers raised to accommodate War memorial gates from the former Laurie Knowe Church in 1999. A sandstone cross was erected to the new frontage in 2016 for the 150th anniversary and in the memory of the Rev Gordon M A Savage. Sculptor – Max Novell.